The makeLab global design team is continuing to explore a variety of concepts, but is still searching for the illusive perfect idea that the team can be satisfied with. The team, which has been dubbed with the name “Architecture Without Limits;” due to the fact that this is the rare project that seemingly has no limits; continues to narrow the focus and soon hope to land on the idea that will be realized this summer in China. The Latest output from the team was an attempt to create a structure to serve as shelter and stage through a series of stacked and shifted plates. 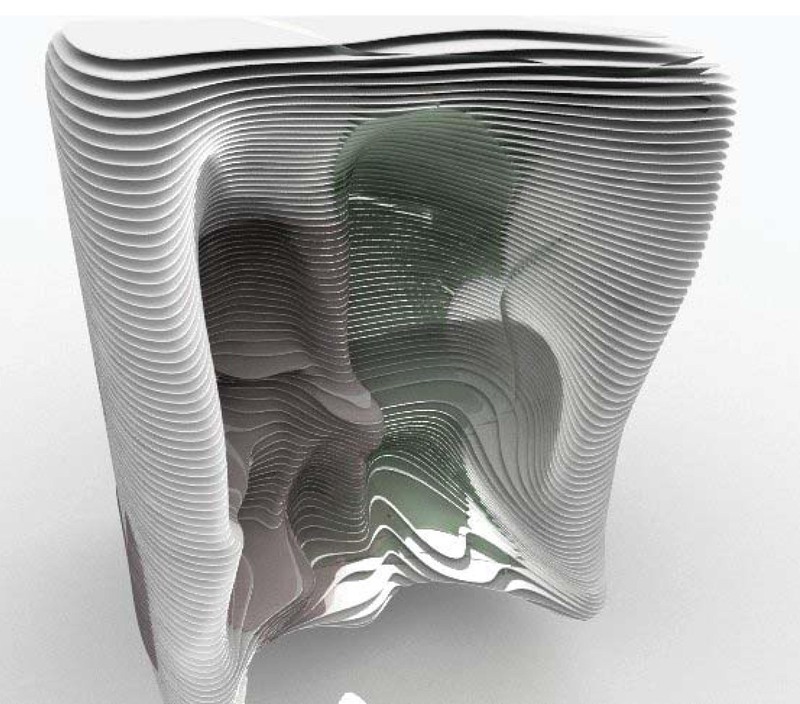 Using algorithms generated in Grasshoper, the plates were morphed into tooth-like shaped forms that when stacked form two voids suitable for an individual to occupy. The structure is morphed in such a way that each void contains a bench and a pass-through from one void to the other, which can serve as a table. The voids would be able to offer shelter, a place to rest, or a semi-private area in which two people could converse through the pass-through. The structure is also intended to be used as stage; two singers could possibly use the structure as a backdrop for impromptu street opera performances. The design, although beautiful and elegant, has been scraped along with about 20 others the team has generated. This particular idea was let go due to the wrong ratio of material to labor. The reality that the design was high on material cost and low on labor hours, is the inverse of the model the team is trying to achieve in order to take advantage of lower labor costs in China. The Team is currently continuing to prototype and experiment with a variety of ideas, and as summer approaches, the team is beginning to close in on a solution. So when attempting to design architecture without limits the philosophy may just be: try everything, something will work. can this really be classified as a shelter or a stage? street performers are there for a reason. to get noticed. both can be accomplished by using less materials and by possibly engaging a site or existing space better.